Grade II Listed Town Centre Office Premises with Spacious 3 Bedroom Maisonette over with Tenants on a Secure Tenancy. Good frontage of 4.67 sq.m/50.26 sq.ft. Set over 2 floors, total area extending to 195.34 sq.m/2,102.62 sq.ft. Front Office/Shop Area, 3 Ground Floor Offices. 3 Further First Floor Offices, Staff Kitchen, WC's. Spacious Cellar Storage & Various Storage Areas on both floors, Rear Pedestrian Access. Available For Sale or To Let. Commercial EPC - E (125). Maisonette EPC - Exempt. Shop - 9.36m x 4.67m (30'9" x 15'4") - (43.71 sq.m/470.49 sq.ft) 2 electric storage heaters. Spacious Inner Hall (1) - 3.66m x 1.95m (12'0" x 6'5") - (7.13 sq.m/76.74 sq.ft) door to Cellar, door to Office (1), Staircase (1) to first floor. Cellar - 10.04m x 4.21m (32'11" x 13'10") - (42.27 sq.m/454.99 sq.ft). Office (1) - 3.23m x 1.94m (10'7" x 6'4") - (6.26 sq.m/67.38 sq.ft). Side Hall (2) - 2.96m x 1.51m (9'9" x 4'11") - (4.47 sq.m/48.11 sq.ft). Inner Hall (2)/Office Area (2) - 8.38m x 2.69m (27'6" x 8'10") - (22.54 sq.m/242.61 sq.ft) storage heater, staircase (2) to first floor. Storage Room - 2.60m x 1.54m (8'6" x 5'1") - (4.00 sq.m/43.05 sq.ft) electric panel heater. Office (3) - 4.43m x 3.62m (14'6" x 11'11") - (16.03 sq.m/172.54 sq.ft) storage heater. Landing/Office Area (4) - 4.66m x 3.59m (15'3" x 11'9") - (16.73 sq.m/180.08 Sq.ft) electric panel heater, built-in storage cupboard. Rear Office (5) - 3.87m x 3.79m (12'8" x 12'5") - (14.66 sq.m/157.80 sq.ft) electric panel heater. Mid Office (6) - 3.98m x 2.89m (13'1" x 9'6") - (11.50 sq,m/123.78 sq.ft). Kitchen Area - 2.08m x 1.58m (6'10" x 5'2") - (3.28 sq,m/35.30 sq.ft) with space for fridge, etc and shelving. Work Area - 2.03m x 1.36m (6'8" x 4'6") - (2.76 sq.m/29.70 sq.ft) stainless steel sink unit with cupboard beneath. Ladies Wc - 2.03m x 1.93m (6'8" x 6'4") - With wash basin. Gents Wc - 1.58m x 0.81m (5'2" x 2'8") - With wash basin. 16B Broad Street - Approached from the rear of the property. Bathroom - with 3 piece suite. Kitchen - 4.48m x 2.76m (14'8" x 9'1") - base and wall units, stainless steel sink unit. Living Room - 4.77m x 5.02m (15'8" x 16'6") - 2 windows on to Broad Street, gas fire. Business Rates - Rateable Value: £9,500 per annum (2018). Please note there is a secure Tenant in the property who has been in residence since 1964 and currently pays £69 per week. Commercial Energy Performance Certificate - A full copy of the Commercial Energy Performance Certificate is available on request or from our website. 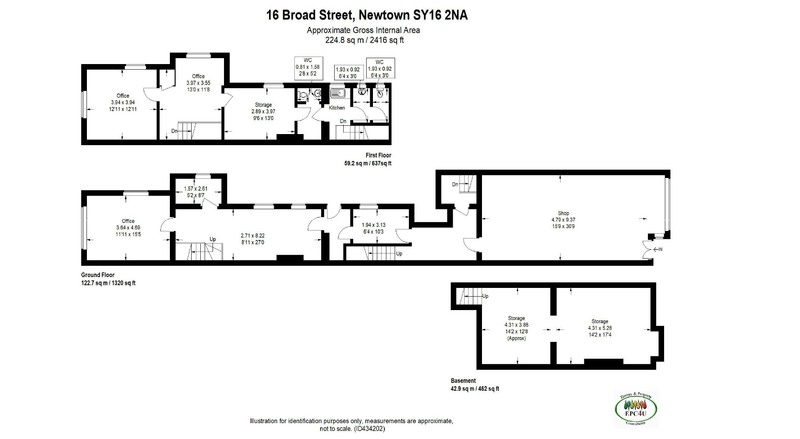 Directions - From our office in Newtown, leave the office turning left and proceed along the street and the property can be found a short distance on the left hand side.